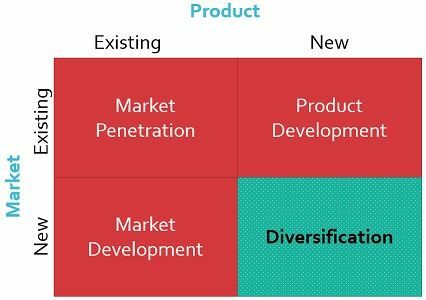 Definition: Diversification can be understood as the corporate strategy that a company implements to increase the market share and sales volume by introducing new products in new markets or industry, which is distinct from its core business. Simply put, diversification refers to the expansion of business by entering into a completely new segment or investing in a business which is external to the scope of the company’s existing product line. Businesses use this strategy for managing risk by potential threats during the economic slowdown. Vertically Integrated Diversification: The form of diversification in which the firm intends to enter in the business which is associated with the firm’s present business. In this way, the firm stays in the same business and moves ahead or reverse in the chain and introduces new product so as to enter the new business for the firm. Forward Integration: It is a kind of vertically integrated diversification, wherein the firm decides to move ahead in the value chain that is directly related to the firm’s existing business, so as to ease the distribution process. Backward Integration: In this type of integration, the firm opts to move backwards in the value chain so as to create an effective supply of the goods by expanding the business and entering the business of suppliers. Horizontally Integrated Diversification: In horizontal diversification, the firm acquires one or more than one businesses that are engaged in the similar business and at the equivalent level of production-marketing chain to enter into complementary goods, or taking over competitor’s products. Related Diversification: When the new business has some sort of connection with the existing business then it is known as related diversification. It includes the exchange of business assets by exploiting marketing skills, manufacturing skills — economies of scale, brand name, research and development, etc. Example: A cloth manufacturing firm enters into the distribution of clothes. Unrelated Diversification: When the new business has no relation to the value chain activities of the company. It includes investing in new product portfolios, concentrate on multiple products, minimization of risk by operating in various product markets, implementation of new technologies. Example: An FMCG company enters into the textile industry. Concentric Diversification: It is similar to related diversification, wherein the new business entered into by the firm is associated with the existing business by way of process, technology or market. The newly entered product is a spin-off from the already existing facilities. Hence, there are advantages of synergy with the existing operations. Conglomerate Diversification: The conglomerate diversification is similar to unrelated diversification, there is no relationship between the new business or product and the existing business or product in any way. Firm’s use diversification strategy to reduce risk, use surplus cash, build corporate brand equity, increase customer base, exploit new opportunities, effective capital utilization, build shareholder’s wealth, access to the new market, etc.